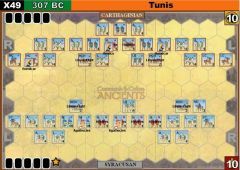 The Greeks started nicely with a Line Command, moving forward all their forces on the right and in the center. The Persians came back with a Move-Fire-Move and got hits on 3 different Greek Hoplites. A bad roll with Spartacus only activated one Greek Hoplite, who plunged into the river and exchanged hits with a Persian LB. 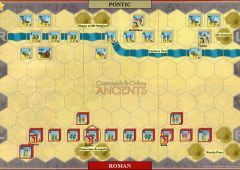 Before long there were several Greek Hoplites in the River, and the Persians played a Line Command and racked up 5 hits. The Greeks used Counterattack, but in that battle, hits were evenly exchanged and the Greeks were getting torn up. The Persians attacked on the flank and each side lost a Light Bow. 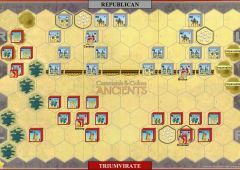 On the next Persian turn, another Line Command meant difficult times for the Greeks, and 3 of their Hoplites were destroyed. But they still had some fight left in them, and a Greek Outflanked card saw the demise of a Persian Light Bow and an Auxilia. 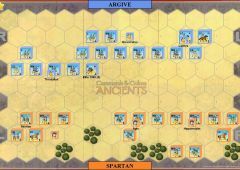 A Persian Medium Troops card seemed to portend the death knell for the Greeks, but three close combat attacks (including one bonus close combat) against 1- and 2-block Hoplites resulted in not a single hit. 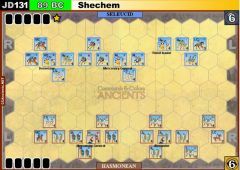 A final attack did yield a single hit – against a 3-block Hoplite. 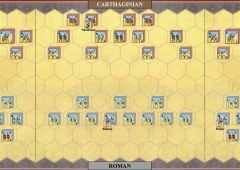 So the Greeks get another chance, with a Hoplite & leader Xanthippus attacking a 1-block Auxilia in a fortified camp – and the roll is Blue, Red, sword (ignored in camp) and banner (ignored in camp). The Greeks also missed against another 1-block Persian light unit. 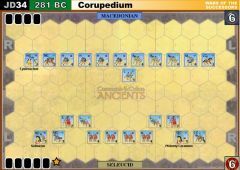 Finally, two Persian MI, each with a leader, blocked Xanthippus’ retreat and eliminated his hoplite for the 5th banner and Persian win. Ben & I both agreed it was a fun game – his first wargame, he told me, and he really enjoyed it. I certainly had some luck with the cards AND the dice. EZPickins (Greek): 5 banners & lost 14 blocks, won. Andygor (Persian): 2 banners & lost 20 blocks. EZPickins (Persian): 4 banners & lost 30 blocks. Andygor (Greek): 5 banners & lost 22 blocks, won. Last edit: 1 month 10 hours ago by Andygor. If any players have NOT arranged matches with their opponent, could you please let me know ASAP. I still did not managed to schedule my game with Shiva. Sending him another couple of possible time slots now, but please work on "re-arrangement". If you can not for some reason to contact the Russian-speaking players, you can try to write to me. I have all their contacts, and I will try to connect you quickly. Guys, can on the future makes sense players from Australia bring with players from Siberia? They have almost the same time zone. We just have one pair Canada-Ural mountains. and to win back one need to play at night. I wonder how the guys still played. I understand that when there will be a playoff this will not be avoided. But it may be at the stage of selection can be rarebit couples considering their time zones. Once again, I apologize for this offer. I should probably explain that the Round 1 draw was done by pairing one of the 14 players that are new to tournaments with players who have played several tournaments. This was to both guide the new players, and to ensure the tournament procedures went through smoothly from the first instance. I confess I didn't really look at time zones. Being in Sydney, most of my games have timezone factors, and 10-18 hour time differences are pretty routine. Scheduling can be hard,, but even close/same time-zones have that problem. Busy lives. So whilst I'll try and be more timezone compatible in future rounds, the pairing from Round 2 on are done by cumulative score, with opponent strength as the tie breaker. That kind of sets up pairings without regard to other factors. Mark, you are absolutely right when you make a pair of "novice veteran", I think most Russian - speaking players came to the tournament for the sake of experience with players from around the World. The fact is that we held a special tournament for Russian-speaking players on a different platform. And the players in our time zones got to know each other. Therefore to reduce them again in this tournament only on time a sign - can be and it isn't necessary. I understand that as an organizer you have a difficult job, and I support any decision you make. My suggestion to arrange the matches Australia-Siberia - was not a criticism. The main thing is the principle of sport, I think it all support. I can understand both sides to some extent. Having played in online chess tournaments in the past, I know how hard scheduling can be as participants from all over the world competed in those events. Even worse, we only had 1 week in order to schedule as well as conduct our games. In the end, you can only try and be flexible and probably try and reserve a Saturday or Sunday for a C&C match as weekends probably give the best chance to find a suitable time for both sides regardless of their individual timezones. However, I can also understand that playing at odd hours isn't fun at times since this is a tournament and everyone wants to give his or her best. So kudos and thanks to everyone who tries to be flexible accommodating! 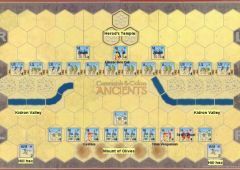 The Persian gods failed a great general on this day, as Leonardo had a great plan, and was a step ahead all game long, before being let down by a series of disastrous dice rolls that sealed the victory for the Greeks. 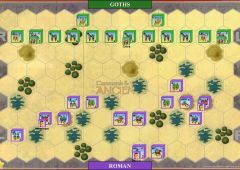 Kept off-balance by the ranged attacks throughout, even losing an Athenian hoplite to consecutive double symbol hits, the ragged Greek assault grew desperate. The outnumbered Spartans forced a crossing of the river, and scaled the heights to gain a foothold. 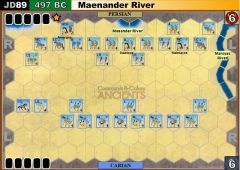 As the Greeks were prepared to send the remnants of their tattered forces all the way across the map to somehow join together in hopes of a miracle, a slim opportunity appeared in the center and the Greeks were able to utilize a Mounted Charge to force the pinned front ranks of the massed Persians to fight. 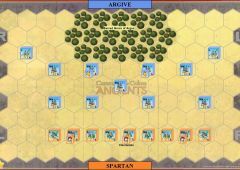 Mardontes was killed, and the Greeks withstood the ensuing counterattack to finish the game. Miraculous come from behind victory. The dice again betrayed Leonardo as he put together an excellent plan only to be stymied by poor rolls. 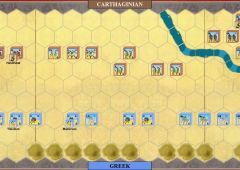 His hoplites threatened the center, right, and left at various times in the game, but could not get the needed rolls to press an advantage, and the Persians were only just able to keep pushing the Greeks back into the river hexes where their superior hoplite units could not bring the full weight of their assault to bear. Finally, a Line Command was the last straw, as not only were Persian dice superior, but Persian cards were plentiful and timely. Xanthippes was last seen alive in hand-to-hand combat with Tigranes, and his fall became the final banner needed for victory.